Ring Wars Carolina: Upcoming Event: "Mayhem"
What do you do when the animals start controlling the zoo? When complete chaos starts to take over? 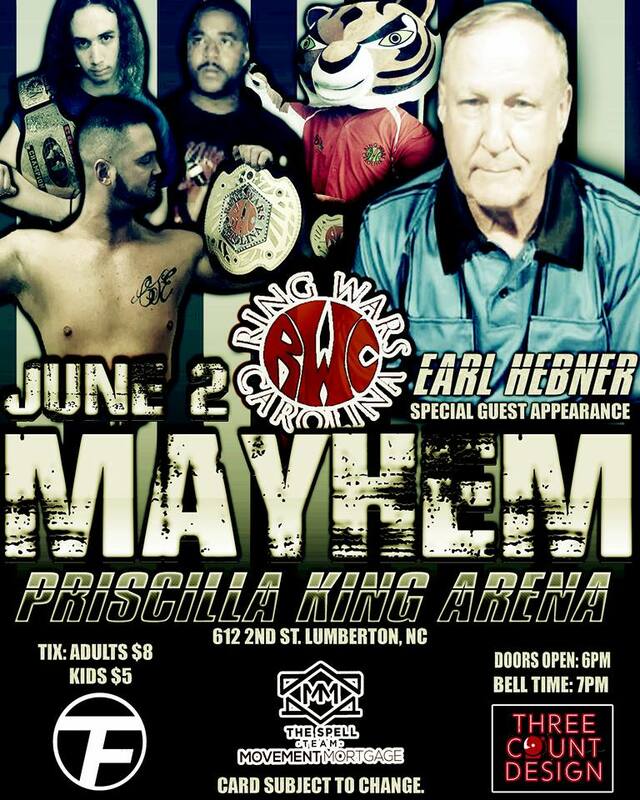 Ring Wars Carolina presents "Mayhem" in Lumberton NC! Some new faces are coming and I think they picked the wrong night to debut for RWC! The New RWC Tag Team Champions, Hangtyme & Joseph Everhart will be in the house looking to defend the Championships. The Award winning Author, female wrestler Lynzee Pike will be in action. She will be taking on Superstar Roni Nicole! Multiple tours in Japan and former RWC start up I may add. she is coming to publish Lynzee Pikes last chapter titled "Big Bang"! The rematch of all rematches, Devin Worthy has laid a target on The RWC 4 County Champion Drew Thomas. Last week these 2 showed why the RWC 4 county tile was a prestiges championship! Devin Worthy busted Drew wide open in efforts to regain the title. With all the blood shed and miscalculations. Drew Thomas is still your RWC 4 County Champion. Lumberton had to to be the place to witness this rematch. The Main Event has Chance Lebeaux & Travis" Mason Jar" Dixon taking on RWC Heavyweight Champion "Nite-Stic" Eddie Brown & RWC Mascot Suplex Sam! This should be exciting, Especially the in-ring debut of Suplex Sam! All this controlled by one man who we know can keep Law and Order! The Best Referee in the Business today! Former WWF, WWE, IMPACT, Earl Hebner! Earl Hebner vows to call everything down the middle and keep control of all the "Mayhem" in the building! See you Saturday night in the Priscilla King Arena located 612 2nd street in Lumberton NC. Doors open at 6pm with a start time of 6:50pm, yeah I said it, 6:50pm!! !